India’s Polar Satellite Launch Vehicle is targeting liftoff on Friday on the rocket’s return to flight mission after a 2017 failure, aiming to lift into orbit a total of 31 satellites ranging from a large Indian Earth Observation craft to various small satellites and CubeSats for remote sensing and technology demonstrations. 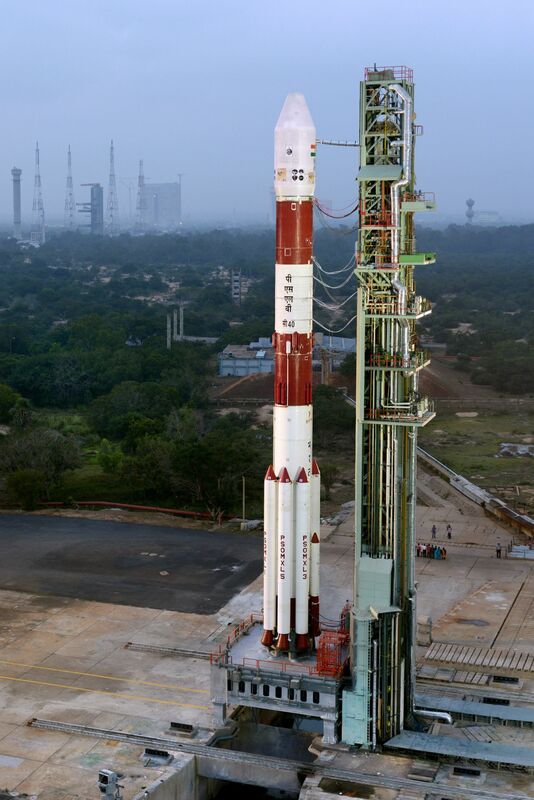 Liftoff from the First Launch Pad at the Satish Dhawan Space Center is set for 3:59 UTC and PSLV will be in action for two hours to first dispatch thirty of its payloads into a 500-Kilometer orbit and then drop to 360 Kilometers to deploy the final satellite. Friday’s launch will be the 42nd mission of the PSLV workhorse and mark its return to flight after a failure in August 2017 that ended a streak of 36 successful missions in a row performed over the last 18 years. Lifting off from Sriharikota with a replacement satellite for the Indian Regional Navigation Satellite System, PSLV appeared to be well on its way when failure struck at the point of payload fairing separation. In fact, the fairing never came off and the rocket limped into orbit with the additional weight of the fairing and trapped the 1,425-Kilogram satellite inside when separating from the rocket’s fourth stage. The fairing as a failure point came as a particular surprise since the system and its larger variants flying on the GSLV rocket had never caused any trouble in the past. Because PSLV had flown successfully three dozen times and is considered a matured design, ISRO quickly moved from looking into possible design flaws to focusing on manufacturing defects and quality control problems. Through telemetry, it was verified that the payload fairing separation was commanded as planned and the pyrotechnics responsible for initiating the separation were fired. The fault was found within a rubber bellows that was to inflate and expand using pressure generated by a mild detonating charge in order to create the force needed in the interface between the two fairing halves to shear the rivets holding them together and push them outward. It was found that a defect within the rubber bellows did not allow pressure to build up, causing the fairing halves to remain firmly attached to one another and in place atop the PS4 stage of the rocket. 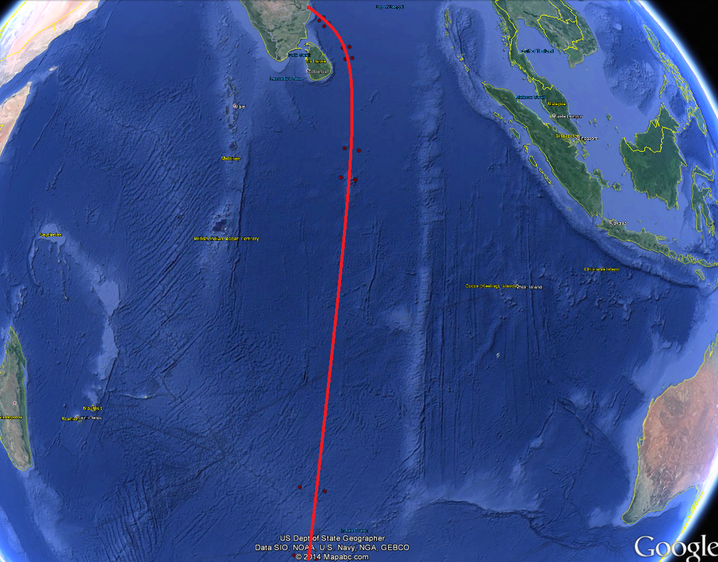 As a result of PSLV standing down for the investigation, the C40 mission slipped from an initial target date in November into the new year. The launch campaign itself was one of PSLV’s fastest to date, lasting under seven weeks from the start of launch vehicle assembly on the First Launch Pad at SHAR to the target launch date. 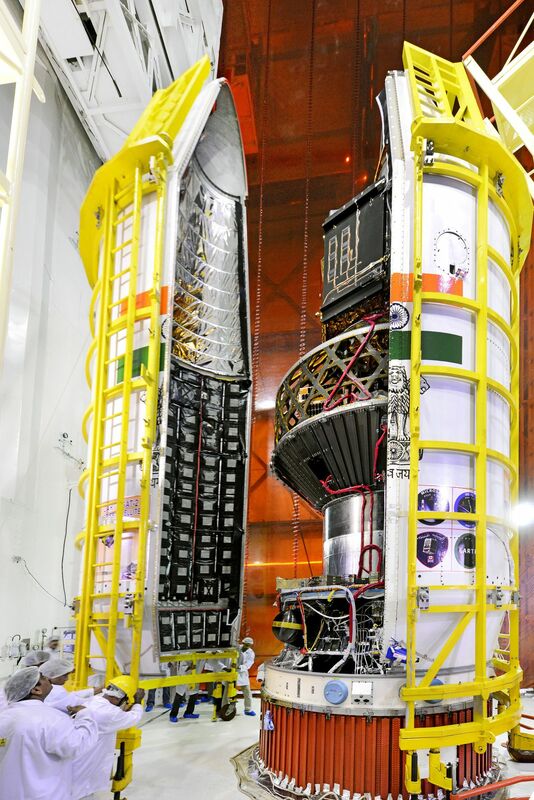 Hidden under PSLV’s eight-meter tall payload fairing are 31 satellites for a total payload mass of 1,323 Kilograms. 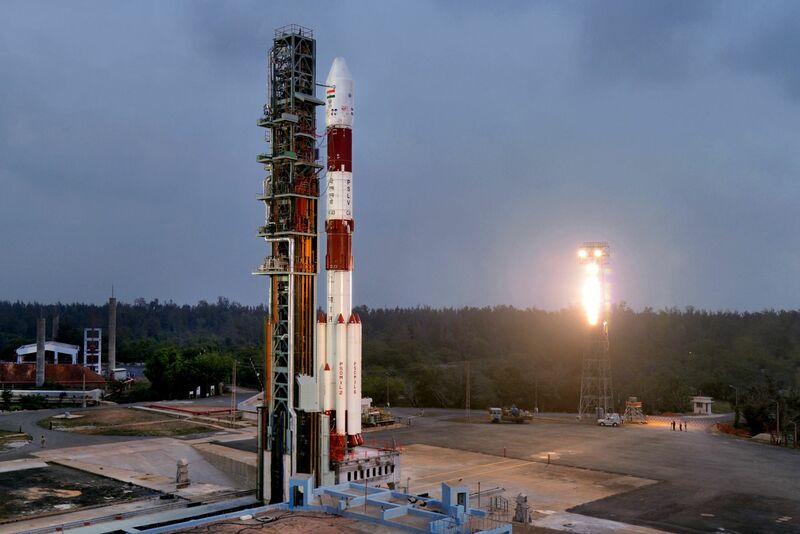 More than half of that is represented by the mission’s primary passenger, the 710-Kilogram CartoSat-F satellite – the sixth member to join India’s prime Earth-Observation System that deployed three satellites in the last year and a half. The secondary payloads, weighing 613 Kilograms, include two Indian satellites launched by ISRO and 28 international rideshare satellites launched by Antrix for satellite operators in Canada, Finland, France, South Korea, the UK and USA. The CartoSat-2 series delivers high-resolution and multi-channel imagery for use by the Indian military plus a number of civilian applications in cartography, urban planning, environmental monitoring, resource management and disaster relief. The satellite is outfitted with a 70-centimeter telescope feeding a pair of instruments – a high-resolution Panchromatic imager that delivers black and white images at a ground resolution of 65 centimeters and a four-channel visible and near-infrared instrument capturing imagery at a resolution of two meters. 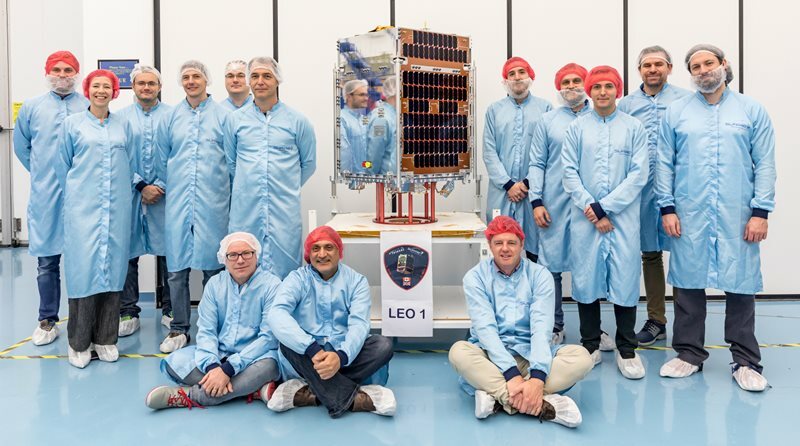 The co-passengers on this mission include a microsatellite and nanosatellite from India, three microsatellites and 25 CubeSats ranging in size from 0.25 to 6 CubeSat Units. Two of the microsatellites were built by UK’s Surrey Satellite Technology: Carbonite-2 serves as a pathfinder mission for the Earth-i commercial imaging constellation set to begin deployment in 2019 while Telesat Phase-1 LEO will act as a demonstrator for Telesat’s planned low-orbit communications infrastructure. Telesat planned to launch two demonstrator satellites, one built by Space Systems Loral and one from SSTL, to a) prove their concept of low-latency communications through a LEO constellation and b) test out different satellite platforms before choosing a contractor for the operational constellation. However, the company lost the SS/L-built demonstration satellite in November’s Soyuz launch failure and will have to move forward with only one test spacecraft. The third international microsatellite is the first prototype for the Finish ICEYE Synthetic Aperture Radar Constellation that will see three prototypes launch this year followed by an initial constellation of six operational vehicles to collect medium-resolution radar imagery at high revisit time for various applications such as sea ice monitoring. A plethora of CubeSats is riding on the C40 mission including new additions to Planet’s Flock of CubeSats and Spire’s Lemur constellation, the CICERO weather constellation and AstroDigital’s Landmapper system, but there are also a number of one-off demonstration missions and university CubeSats exploring interesting new technologies. 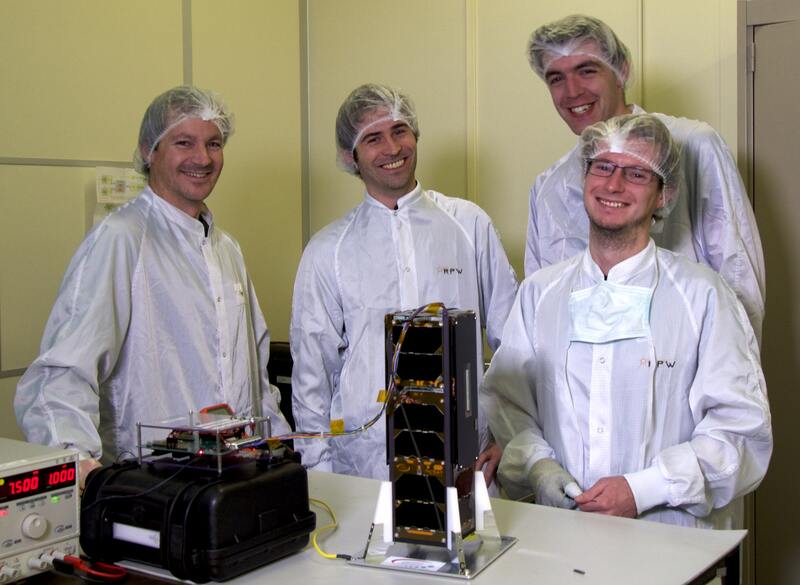 PicSat from France sets out to demonstrate a miniaturized interferometric instrument that could build the foundation of a future constellation of Exoplanet-hunting CubeSats, a feat not possible with flagship class science missions that can not be launched in large numbers. “Tom and Jerry” are the names of the CANYVAL-X project, a collaboration between NASA and a South Korean University to test out in practice whether two satellites can be aligned along an optical axis to form a virtual telescope to open up possibilities for future astrophysics missions. The other South Korean satellites flying on PSLV C40 are CNUSail-1, testing out a 2 x 2-meter deployable sail that could double as a solar sail and deorbit device; SIGMA, hosting a radiation-dosimeter and magnetometer; KAUSAT 5, acting as technology demonstrator carrying an infrared instrument and Geiger-Müller counter, and the STEP Cube Lab that packs five innovative technology demonstrations into a 10 x 10 x 10-centimeter satellite. MicroMAS-2 carries an MIT-developed radiometer for the collection of atmospheric pressure, humidity and temperature data for operational weather forecasting and climate research – a potential game-changer if the CubeSat based instrument proves as effective as large-class microwave instruments that are 25 times as massive as the entire CubeSat. 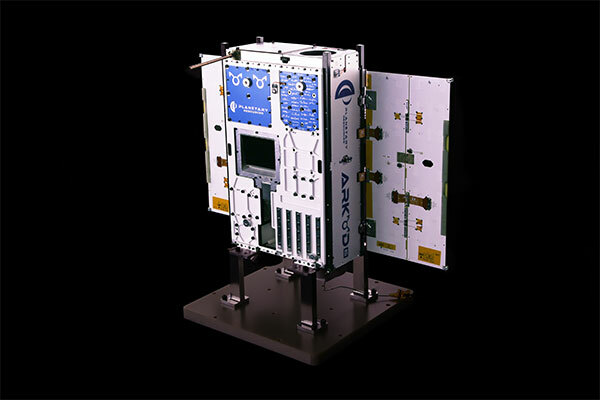 Planetary Resources has placed its second orbital testbed on the PSLV C40 mission: Arkyd-6 will test the company’s second-generation avionics system to be deployed on the Arkyd-100 asteroid prospecting telescopes and a mid-wave infrared instrument capable of sensing water and water-bearing minerals will be demonstrated for future use in asteroid survey missions as the company progresses toward the ultimate goal of mining asteroids for the resources they offer. ISRO made strides in the commercial rideshare business last year when PSLV set the record for most satellites launched by a single rocket, deploying a total of 104 satellites of different shapes and sizes. 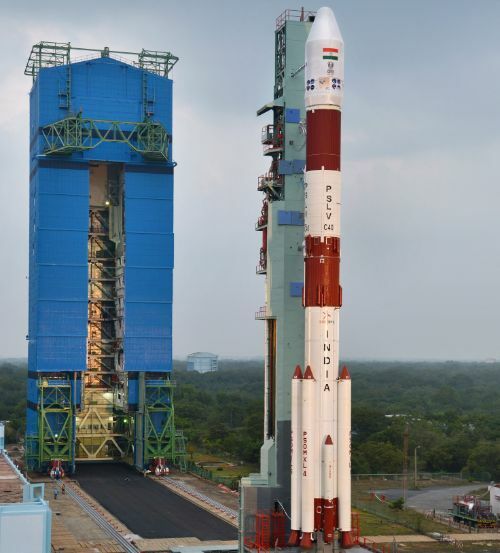 Improvements made on the PSLV rocket now allow it to fly multi-orbit missions, that is deploying groups of payloads to different orbital altitudes via re-start capability on the fourth-stage and provisions for long-duration coast missions. 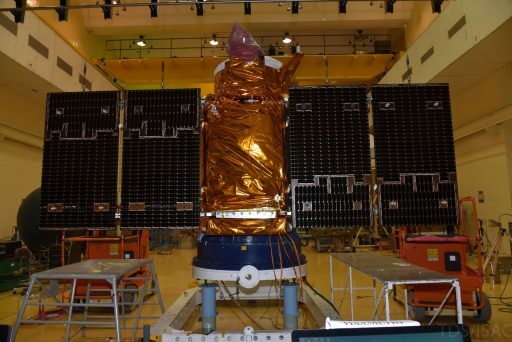 This capability will again be highlighted on Friday as the mission aims to deliver thirty of its payloads into a Sun Synchronous Orbit at 505 Kilometers in altitude, inclined 97.47 degrees followed by a pair of orbit-lowering maneuvers and slight inclination adjustments to send the ISRO-developed Microsat-TD into a 359-Kilometer SSO, creating a mission duration of two hours and a total of four upper stage burns. 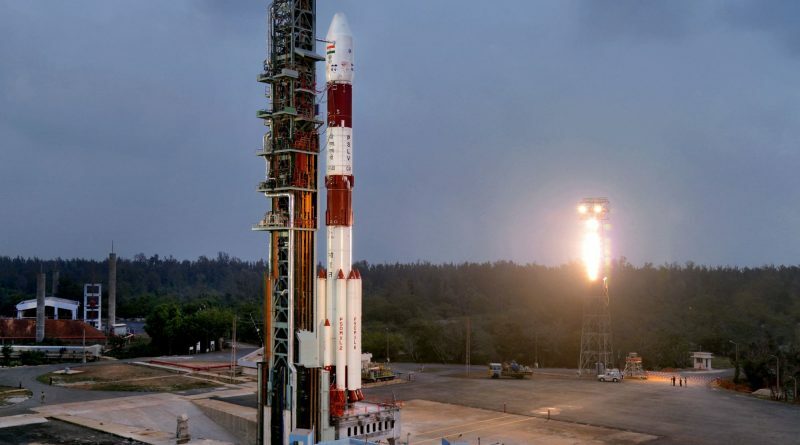 PSLV is flying in its XL configuration on Friday, leveraging the raw power of solid rocket motors in combination with the precision of liquid-fueled engines to accurately inject payloads into a variety of orbits. PSLV XL stands 45 meters tall and weighs in at 320 metric tons, featuring a large solid-fueled core stage with six boosters, a Vikas-powered second stage, solid-fueled third stage and a hypergolic-fueled fourth stage. Initially headed to the south-east, PSLV will drop its 13-meter long boosters at 70 and 92 seconds into the mission followed by burnout of the core stage at T+1:49 after it consumed 168 metric tons of solid propellant. Separation of the second stage will be completed split seconds after first stage burnout as powered flight is handed over to the 81,500-Kilogram-force Vikas 4 engine that will fire for two and a half minutes. PSLV will split open and separate is payload fairing halves two minutes and 32 seconds into the mission when passing 115 Kilometers in altitude where aerodynamic forces can no longer harm the satellites. Naturally, this event will be watched closely to ensure all signatures of a clean fairing separation are received. Vikas-4 will shut down four minutes and 21 seconds into the flight, handing off to the solid-fueled third stage that will be tasked with a 113-second burn at an average thrust of 25 metric ton-force. A short coast phase occurs between burnout on the third stage and the ignition of the twin-engine fourth stage at T+8 minutes and 22 seconds on a burn of eight minutes and 15 seconds to finish the task of lifting PSLV into a Sun Synchronous Orbit just over 500 Kilometers in altitude. CartoSat-2F is targeting separation at T+17 minutes and 19 seconds followed by the jettisoning of the DLA-U adapter and a fast-paced sequence over the next six and a half minutes to deploy all but one of the secondary passengers. ISRO’s Microsat-TD, only called “Microsatellite” in official documents, will remain attached to the PS4 stage which will re-light twice at T+58 and T+104 minutes to drop its orbital altitude and send the ~120-Kilogram satellite on its way into a 359-Kilometer orbit. Another braking burn of the PS4 stage at the T+2-hour mark will further lower its orbit in order to speed up its re-entry.